I love these periods of settled weather. Water clarity is great which helps with lure fishing and seems to bring species such as Gurnard, Bream, Red Mullet and Dragonets closer to shore. The quicker the water warms up the sooner the Trigger fish will appear. I love fishing for Trigger fish. Knowing that they are normally found a long way from British shore, and that there are very few places in the UK to catch them, make them special to me. They are also great fighters, especially if you scale down your tackle. I will do a post on Trigger fish in the next couple of weeks, for those that fancy having a go at them. Reports coming in from Chesil Beach suggest that there are quite a few Gurnard around now, with a few Black Bream being caught as well. I have spent the past few days lure fishing for Bass, Wrasse and Thin Lipped Mullet. It is good to see that the lure fishing action has really picked up now. The May water is still present between Abbotsbury and West Bay, where one of the site regular contributors Neil fished yesterday. He headed down to fish between 1pm and 9pm. All he managed was a couple of Mackerel during that time. He tells me that all he seen caught whilst he was there was one other angler catching a half dozen Mackerel. Chesil Beach: Flat calm and clear water East of Abbotsbury, but coloured to the west of Abbottsbury. Chesil Beach forecast: It seems that to improve your chances of success on Chesil, you will want to try fishing down the Eastern end of the beach towards Portland. That is not to say that Abbotsbury or West Bexington wont fish, but if you want Bream, Gurnard and Mackerel your chances are far greater where the water is clearer. The whole of the beach will fish for Bass and Smoothound, with Peeler Crab being my top choice of bait for those species. I know Peeler are hard to get hold of and expensive. Hermit Crab is a cheaper alternative and unlike Peeler Crab, I have had some success with frozen ones. 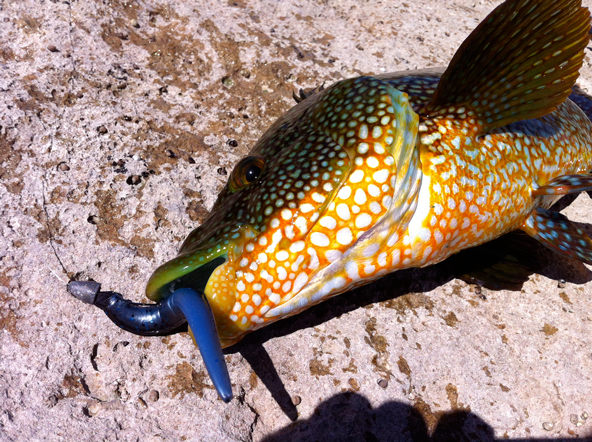 Portland: Day time fishing around Portland Bill and Church Ope Cove has been producing plenty of Wrasse. I managed a few on soft plastics yesterday. The tides this evening are great for a chance of Pollock at Dusk on white Sidewinder’s. There is always the chance of a bous Bass. Portland Harbour: Another area that I fished yesterday was around Ferrybridge. I spotted a load of Mullet in the little bay opposite the Ferrybridge Pub. I suspected that they were Thin Lipped Mullet, so I rigged a Mepp’s up with a piece of Berkley Power worm and within 2 casts I had a follow. It seems I got lucky and had a whole shoal of Thin Lips right out in front me. Weymouth Bay: The Mullet have been keeping plenty of anglers busy in the harbour. Most of them are Thick Lipped Mullet and have been falling to bread. Further round the Bay, Preston Beach has been fishing very well, with plenty of Bass being caught by lure and fly fishermen. Bait anglers have been catching plenty of Gurnard and Flounder from the same mark. 2 Responses to "Catch report & fishing forecast for Dorset including Chesil Beach, Portland & Weymouth"
Me and a mate have been spinning for the last month for bass with no joy what so ever (5 blanks). Can you put us on the fish in and around weymouth.